A woman artist of the 90’s was Mrs. Al Price, 311 Second Street. She painted over 200 pictures, large and small. She came here from the backwoods of New York State, not knowing what an oil painting looked like. Her first marriage was to Robert Dent. She was a pupil of Mrs. Ballou and would sometimes sit up until 4 a.m. 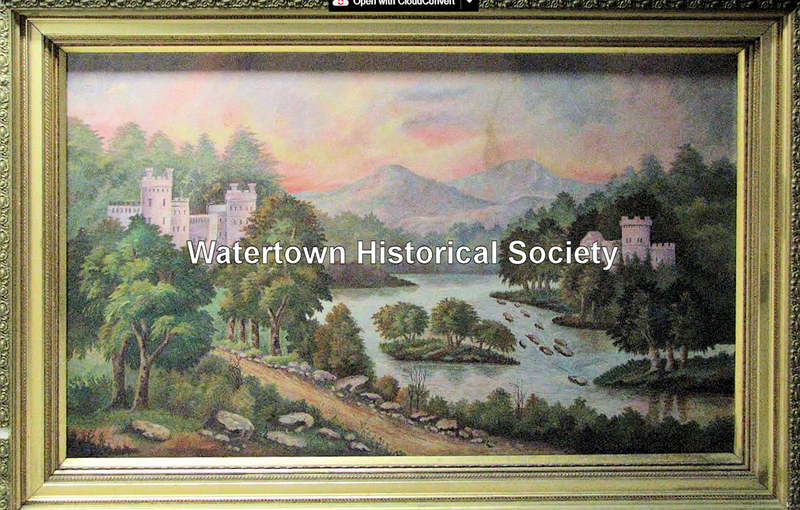 Her largest picture was the painting of the waterworks – it was 5x3 feet in size. She was also a china painter, a popular skill of that period, and fired her own china in her own kiln. Watertown Wisconsin Centennial booklet, 1954, pg 60. In the history of business development in Watertown manufacturing has played an important part and active in that field is Robert M. Dent, who is treasurer and general manager of the Brandt-Dent Company, engaged in the manufacture of electric light and gas fixtures, in which connection has been developed a business of large and substantial proportions. Mr. Dent is a native of Ilion, New York. He was born November 2, 1847, of the marriage of William and Jane Dent, the former for many years a merchant of Utica, New York. The son acquired a public school education and after his textbooks were put aside was associated with his father in business until 1882. He then became superintendent of the Hinman Machine Company of Syracuse, New York, and from 1887 until 1890 was superintendent of the Utica Gas Fixture Company. All these associations were giving him knowledge and experience that have constituted the basis for his success in later life. In 1890 he came to Watertown and in connection with Messrs. Schultz, Brandt, Tuttle and Mangold he organized the Western Manufacturing Company for the manufacture of gas fixtures. Of this company he became the superintendent and secretary. Two years later they formed the Brandt-Dent Company, of which Mr. Dent became the secretary and treasurer. This company manufactured gas fixtures and change machines. The business was conducted until 1909, when the partnership was dissolved and Mr. Dent took over the gas fixture business and broadened the scope of his interests by also taking up the manufacture of electric lighting fixtures. Of the company he still remains the treasurer and general manager, with Gabriel B. Levy, of Boston, as the president and George Richards as secretary. Their plant is a two story and basement structure containing fifteen thousand square feet of floor space and they employ seventy people, of whom one-half are skilled workmen. Their product is sold all over the United States to both dealers and jobbers. They have their own designing department and their fixtures are most attractive in design. The business from its inception has been a growing one and today constitutes one of the important industries of the city. In 1878 Mr. Dent was united in marriage to Miss Anna Ogden, of White Plains, New York, and to them were born two sons, William and Robert, but both have passed away. They have an adopted daughter, who is now Mrs. John Moore and is a resident of Watertown. Mr. and Mrs. Dent hold membership in St. Paul's Episcopal church and he is well known in Masonic circles. He has held all the chairs in both the chapter and commandery and has been active in the Grand Commandery. Of the Elks of Watertown he is a charter member. His political allegiance is given to the democratic party and he is now serving as supervisor of the first ward. He is also chairman of the police and fire commission and he stands for progressiveness and efficiency in public service. While he is opposed to useless extravagance, he does not believe either in useless retrenchment which hampers public improvement. In a word, he manifests the same sound judgment and discrimination in the discharge of his official duties that he does in the management of his private business interests and in the latter connection these qualifications have brought him deserved success. At 7 o’clock on Sunday morning, March 16, 1919, Robert M. Dent died at his home, 311 Second Street, of bowel trouble, with which he had been a sufferer for years. For over four years he had been a great sufferer, and only a person of great vitality could have gone through what Mr. Dent has without passing away long ago. For weeks at a time he was confined to his home, and again he would venture out and look after his business interests, only to suffer a relapse once more and he was compelled to remain at home. He bore his long suffering with a true Christian spirit and no one would ever know on meeting him that he was undergoing great suffering, for he always wore a pleasant smile and greeted his friends with his customary kind and courteous manner, and never lost hope of recovering his health until a short time before his death, when he prepared in a true Christian spirit for his final end and was resigned to the will of his Creator and passed to the great beyond religiously well prepared. Mr. Dent was born on November 2, 1847, at Ilion, New York, and when five years of age he located with his parents at Utica, New York, and when a young man went to Syracuse in the same state, where for 10 years he resided and learned the machinist trade in his father's factory and later on he learned the gas fixture business and had charge of the Utica Gas Fixture Co.
On November 21, 1878, he was married to Miss Anna Ogden, at Syracuse. In March, 1890, Mr. Dent came to Watertown and engaged in the manufacture of gas fixtures and automatic cashiers, being associated with Edward J. Brandt. In 1909 this partnership was dissolved, Mr. Dent taking over the gas fixture business and adding electric light fixtures to his product, Mr. Brandt continuing in the manufacture of automatic cashiers. Aside from being a most successful manufacturer he always identified himself with everything that tended to assist in building up the city in a business and social way. He was a prominent member of the Masonic order, and to him more than any other man in the city at the present time, is our city indebted to for the fine business block in which is located the Masonic temple. He was also a leading member of the Eastern Star, the Milwaukee Consistory, was a Shriner and a charter member of the Watertown Lodge of Elks, No. 666. Politically he always affiliated with the democratic party and his advice politically was always sought by his party associates. The writer of this article had many occasions to know of Mr. Dent’s splendid character, having for many years had occasion in an official way politically to learn his true worth. His ideals were always good and clean and he never resorted to petty things, like so many politicians, to gain a point on his political opponent. The same can truly be said of him in a business way. At the time of his death he was president of the Police and Fire Commission of this city, and supervisor of the First ward, a position he honorably filled many years. He was also a director of the InterCounty Fair Association since its organization. His wife survives him, who during his long illness cared for him in a manner that was edifying, and like her husband bore her cross with a truly Christian spirit. One daughter also survives him, and two grandchildren, Mrs. John M. Moore and Grace Evelyn and Catharine Marion Moore. One brother, Albert Dent of Washington, D.C., and three sisters, Mrs. William Ross of New Haven, Conn, Miss Sarah Dent and Miss Maria Dent of Utica, New York, also survive him. Mr. Dent’s funeral took place this afternoon from St. Paul’s Episcopal church, the Elks and members of the Masonic order attending in a body, also members of the city government. The interment was in Oak Hill cemetery. Very few men enjoyed the esteem and respect of his fellow-citizens at large as did Mr. Dent. He was honest in his business dealings, kind and good natured to everyone and always a friend to those in trouble, and was particularly devoted to his family. The city of Watertown will miss him in many ways, and his noble character and his influence for good will bear good fruit for many a day. He lived a good and useful life, and for such a man there is no question but that now he is enjoying peace and true happiness in the heavenly kingdom. Oil painting dated March 9, 1897, found in basement of St. Mark’s church in 2017. Approximately 3’x5’ and signed by Mrs. Robert Dent.